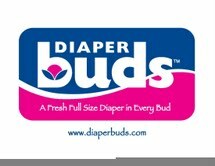 DnBuster's Place: Diaper Buds-A fresh full size diaper in every bud! 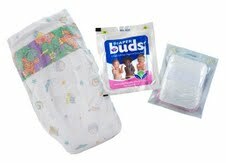 Diaper Buds-A fresh full size diaper in every bud! This review is part MomPact Go, Travel Promotion. 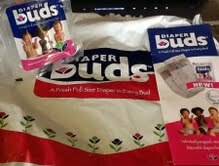 I was given the chance to review Diaper Buds! When you are out and about and on the go with the kiddos, what is the one thing you can never seem to find any where in a hurry?? For me its always diapers! Diaber Buds solves that problem!! They are compact and fit anywhere and everywhere! They fit in the glovebox, purse or diaper bag with ease! Diaper buds are neat and so compact! When you open the sealed package and remove the white band around the diaper it buds out! It opens into a REAL full size diaper! It even has a neat and friendly design on the band of the diaper! 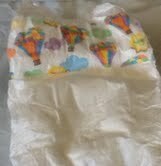 DiaperBuds are the first full-size, disposable diapers of their kind. Mom-invented, top-quality and individually wrapped to be compact and dirt-proof. Toss one in your purse or slip one in your pocket for dinner out with the family or errands out with the baby. Store some in your glove compartment or diaper bag for anytime out-of-home baby changes. Perfect for family travel, day trips, outings and great for the beach. The best invention since disposables! 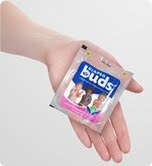 Diaper Buds are available at buybuyBaby.com, BabiesRUs.com, diapers.com and Amazon.com. I like that DiaperBuds is a mom-invented product. The pouches are water proof and are a great saver when you need a diaper fast! I liked the quality of the DiaperBuds and they held up great! My tester was a 17 month old little girl! She tried to wear the DiaperBud down by playing extra hard with the boys and it held up really great! No sagging or leakage! 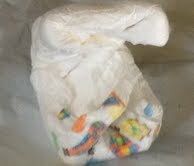 My family and I give DiaperBuds a 5 out of 5, for convienve and quality!! They are great for on the go! disclosure~ I received this review opportunity as part of Mompact.com. All opinions are my own. The giveaway is sponsored by Mompact.com. “invented by moms, for moms”. 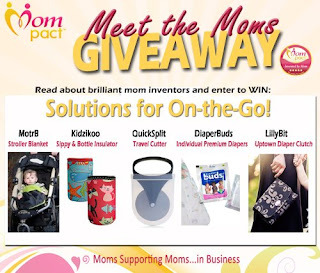 Kidzikoo, QuickSplit, DiaperBuds, Lillybit Diaper Clutch.